The Day we've been waiting for is finally here! 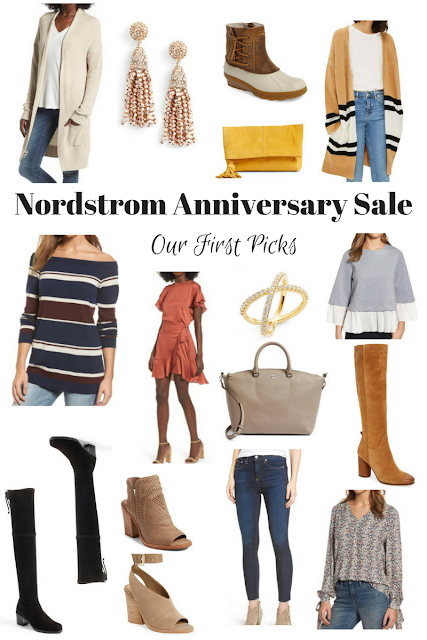 The Big NORDSTROM ANNIVERSARY SALE has started! We can't wait to get into the store to try all our favorites on and share all the details with you. Here is a roundup of our first picks. These are the items that immediately caught our eye. If you see something you love - don't wait! Many items sell out quickly. What's great about Nordstrom is that you can buy online and pick up in your store that same day! Genius!! Follow along on Instagram and InstaStories as we take you shopping with us today. Since I'm in California, I just waited until midnight and looked at the sale then. With just a few exceptions, I swear I didn't even see the majority of what you posted, lol! I ordered a burgundy tie front sweatshirt like you've posted, some tall boots, and the peeptoe booties, but never even saw the Marc Fisher ankle strap booties, and they are gorgeous! I cant wait to see your try on's, and what you ultimately buy!